64mm (51mm eq. ), f/11, 12s, ISO 100. This image has been modified and focus stacked. Click for full-size modified image. Click here for one of the RAW files. 100% crop from the above image. As you can see, the GF 32-64mm is a very sharp zoom lens. Click for full-size modified image. Click here for one of the RAW files. Alongside the Fujifilm GFX 50S camera, one of the three lenses released at launch was the Fujinon GF 32-64mm f/4 R LM WR zoom lens. Despite Fujifilm having since added two more lenses to the GF lens lineup and with its sixth lens scheduled to arrive before the end of 2017, the GF 32-64mm remains the only zoom lens in the lineup so far. With its very high-resolution 50-megapixel medium format sensor, the GFX demands a lot from the glass you attach to the camera. Zoom lenses traditionally come up a bit short, optically speaking, when compared to prime lenses. It's just the nature of the optics. With that said, zoom lenses offer versatility and practicality that a fixed focal length lens cannot. Let's take a closer look at the lone zoom of the GF lens lineup and how well it pairs with the sensor. Like the other GF lenses, the GF 32-64mm f/4 has a semi-matte black finish and a rugged construction. The 32-64mm f/4 is weather, dust and freeze-resistant and has a brass mount. This durable design and weather sealing does result in a fairly heavy lens, which is not surprising for a medium format zoom optic. The GF 32-64mm weighs 30.9 ounces (875 grams), which is not far off from the non-VR Nikon 24-70mm f/2.8G lens' weight, for example. The lens does extend when you zoom out, roughly a bit over an inch (around 2.5 centimeters) when you go from 32mm to 64mm. Importantly, the lens feels similar at both ends of the focal length range and balances really nicely with the GFX 50S body. The GF 32-64mm comes with a very nice, locking lens hood and a soft pouch. It may seem like a small thing, but I really do appreciate how good the lens hood with its locking mechanism is on this lens. I am less keen about the lens pouch, which is a simple drawstring pouch with a semi-rigid base. I keep my gear in a good backpack anyway, so it doesn't much matter, but I expect a better lens case with a $2,300 lens. Moving from the camera body to the end of the lens, the order of rings is aperture, zoom and then focus. The aperture ring is ridged metal and rather narrow, about half an inch wide (15 centimeters). Full stops are marked on the aperture ring, and the ring clicks every one-third stop. It feels precise, making it easy to select the desired aperture without looking at the lens. However, if you'd prefer to use one of the command dials for aperture control, you can do that too by setting the lens to its locked "C" aperture position. The zoom ring is the widest ring on the lens, taking up quite a bit of the overall lens barrel. It is about 1.5 inches wide (40 centimeters) and includes marked focal length positions for 32, 44, 50 and 64mm. To go from 32mm to 64mm is less than a 45-degree rotation. The zoom mechanism is very smooth in use. Beyond the zoom ring is the focus ring, which is about three-quarters of an inch (20 centimeters) wide. There's no focus scale as it's a focus-by-wire system. The GF 32-64mm f/4 R LM WR lens has excellent build quality, and it feels very nice in the hands. The three rings on the lens all work well and the lens balances nicely with the GFX 50S body. Importantly, the lens is weather resistant and having tested that feature extensively, it's taken everything I've thrown at it. It's a true professional workhorse lens when it comes to build quality and handling. The GF 32-64mm f/4 R LM WR lens has 14 elements across 11 groups, including an extra low dispersion (ED) element, 1 Super ED element and a trio of aspherical elements. It's a fairly complex optical formula adding to the density of the lens. As we'll see throughout this section, the lens has been designed very well, and its optics result in excellent image quality across the lens' focal length range and in a wide variety of shooting situations. 32mm (25mm eq. ), f/4, 1/60s, ISO 100. Sharpness test image. Click here for full-size JPEG image. Click here for the RAW file. Sharpness test image. 100% center crop. Click here for full-size JPEG image. Click here for the RAW file. 32mm (25mm eq. ), f/8, 1/15s, ISO 100. As I've experienced with other Fuji GF lenses, the GF 32-64mm f/4 is fantastic even when shooting wide open. At 32mm and f/4, the center of the frame is very crisp with a lot of fine detail. Contrast and colors are good, and sharpness is impressive. Stopping the lens down to f/5.6 just ramps up the performance, not that there was a lot of room for improvement. The apertures of f/8 and f/11 are good too, but f/16 is noticeably softer and lacks the contrast of the very good f/5.6-8 range. 46mm (36mm eq. ), f/4, 1/300s, ISO 100. Sharpness test image. 100% top left corner crop. Click here for full-size JPEG image. Click here for the RAW file. At 64mm, the GF 32-64mm f/4 is, again, sharp wide open, becoming a bit sharper in the center while stopping down until f/11 through f/32, where diffraction becomes increasingly problematic. 64mm (51mm eq. ), f/4, 1/210s, ISO 100. 64mm (51mm eq. ), f/8, 1/50s, ISO 100. What about the corners? At 32mm, the side of the frame is good wide open, but the corners show a bit of blur and some purple fringing. When you stop down to f/5.6, the corners are a bit better, and at f/8, I find that the entire frame is remarkably consistent in terms of sharpness. At 64mm, corner performance is not as good wide open. There is a fair amount of blurring, and it's quite noticeable. Even stopping down does not totally alleviate the issue until around f/11, which is surprising given how excellent the GF 32-64mm lens is at 32mm and f/8. If you are looking for optimal performance across the frame near a 50mm-equivalent focal length, the GF 63mm f/2.8 is probably your best bet. Of course, then you sacrifice the ability to zoom out to a wider focal length. It is worth noting that it's a pretty gradual transition into what I would consider bad performance, which is isolated to just the extreme four corners. Center sharpness is impressive, as is most of the outward areas of the frame, but if you look toward one of the four corners, that's where sharpness falls off most dramatically. At 32mm and shooting wide open, there is a moderate amount of vignetting. Stopping down to f/5.6 reduces it quite a bit, and by f/8, the entire frame is very consistent in terms of overall brightness. 32mm (25mm eq. ), f/4, 1/160s, ISO 100. Vignette test image. Click here for full-size JPEG image. Click here for the RAW file. At 64mm, performance starts a bit better and follows the same trend as it does at 32mm, with vignetting reducing quite a bit at f/5.6 and essentially being eliminated at f/8. 64mm (51mm eq. ), f/4, 1/150s, ISO 100. There is some longitudinal chromatic aberration at 32mm, but it's easily correctable and not particularly problematic. It gets a bit better as you stop the lens down, but it is not something you're likely to need to deal with in real-world shooting. At 64mm, there's slightly more aberration, but again, it's not very apparent even in a particularly challenging scene, which can be viewed in the test shots below. Chromatic aberration test image at f/4 aperture, 100% crops from JPEG files. Click here for full-size 32mm f/4 JPEG image. Click here for the 32mm f/4 RAW file. Purple fringing, or lateral chromatic aberration, is also not a particular concern with the GF 32-64mm lens. A very challenging shooting situation, such as fine, dark detail against a bright background like you can see below, for example, did not result in any issues whatsoever. 64mm (51mm eq. ), f/4, 1/400s, ISO 400. Click for full-size image. Click here for one of the RAW files. 100% crop of the original image. Click for full-size image. Click here for one of the RAW files. At 32mm, there is some pincushion distortion, although it is not too bad and can be easily corrected. There is still some distortion at 64mm, although it is a bit less dramatic than it is at 32mm. It would be nice if distortion were better controlled at the wide end of the lens, but it's a small knock on an otherwise impressive lens. 32mm (25mm eq. ), f/5.6, 1/500s, ISO 640. As you can see, there is not a lot of distortion with this lens that appears in real-world images. This image has been modified. Click for full-size image. Click here for one of the RAW files. 32mm (25mm eq. ), f/16, 1/3s, ISO 100. Sometimes when shooting at the wider end of the lens, some distant objects, such as the trees, can appear to be tilted a bit as you near the edges of the frame. You will also see this in another 32mm landscape shot later in this Field Test. I should preface this section by saying that the Fujifilm GFX 50S autofocus has been slow with each of the GF lenses I've used. It is simply not the type of camera to offer fast autofocus. Thus, what's most significant when evaluating the autofocus performance of the GF 32-64mm f/4 is not so much how fast it is compared to full-frame lenses, for instance, but how fast it is compared to other GF lenses I've used. With that said, the GF 32-64mm is on the slower end of the GF lenses in real-world use, particularly at the longer end of the lens. 32mm (25mm eq. ), f/4, 1/850s, ISO 100. At 32mm, the lens is decently quick in good light, particularly when your subject is not near the close focus distance. It's certainly not a sports lens, but it's plenty fast for portrait subjects. As you increase the focal length, the autofocus seems a bit slower. The biggest drop in speed comes when the light levels decrease or your subject doesn't have a lot of contrast. There have been numerous occasions when shooting landscapes during which this lens couldn't acquire focus, whereas other camera and lens combinations I've used didn't struggle. It's not a deal breaker, but I've often needed to manually focus in the field with the GF 32-64mm f/4 lens. On the plus side, compared to the GF 63mm f/2.8 lens, in particular, the GF 32-64mm focuses quietly. It also is an internal focusing lens with no front element rotation, meaning that it won't change length or affect your use of a lens filter. This is not a lens for close focusing. Its close focus distance is 19.7 inches (50 centimeters) at the wide end and 23.6 inches (60 centimeters) at the long end, which results in a maximum magnification ratio of 1:8.3, which is not strong. For some of my landscape work, I like to have a very close foreground element, and the GF 32-64mm requires that I modify my approach a bit from what I'm used to due to the limited close focus distance. 32mm (25mm eq. ), f/4, 1/1900s, ISO 1600. Close focus test image. Click for full-size image. Click here for one of the RAW files. 64mm (51mm eq. ), f/4, 1/2000s, ISO 1600. Autofocus issues aside, the GF 32-64mm is a remarkable zoom lens in terms of its optical quality. While prime lenses are notable for their combination of speed and optical performance, zoom lenses are very important to my work. I cannot "zoom" with my feet in many of the places I shoot, such as along the coast. It is not always the case that I can simply move closer to a subject, so to be able to zoom in is often critical. If I can make do with a prime in the same situation, that's great, but that's simply not always an option, and I'd prefer not to zoom via cropping if it can be avoided. When cropping is needed, the GFX 50S does offer me plenty of leeway thanks to its 50-megapixel sensor. 47mm (37mm eq. ), f/16, 30s, ISO 100. This image has been modified. Click for full-size modified image. Click here for one of the RAW files. 54mm (42mm eq. ), f/8, 0.4s, ISO 100. 32mm (25mm eq. ), f/4, 480s, ISO 1600. 56mm (44mm eq. ), f/7.1, 1/250s, ISO 1250. 100% crop of the image above. Click for full-size modified image. Click here for one of the RAW files. 36mm (28mm eq. ), f/8, 2.5s, ISO 100. 100% crop of the above image. Click for full-size modified image. Click here for one of the RAW files. 32mm (25mm eq. ), f/4, 1/125s, ISO 1600. 45mm (36mm eq. ), f/13, 1.3s, ISO 100. 43mm (34mm eq. ), f/11, 0.5s, ISO 100. 40mm (31mm eq. ), f/16, 6.5s, ISO 100. As the singular zoom lens in the current GFX lens lineup -- and assuming that Fujifilm's lens roadmaps stay the course -- it will continue to be the lone GF zoom for the foreseeable future. Its practicality makes it a must-have for many photographers. The Fujinon GF 32-64mm not only delivers on its promise of practicality as a normal zoom lens, but it also delivers truly exceptional optical performance across the entire range. 32mm (25mm eq. ), f/11, 1.6s, ISO 100. In fact, having used many similar range zoom lenses -- admittedly usually a bit longer as the 24-70mm is a very common focal length for full frame cameras -- I believe that the GF 32-64mm f/4 is the best I have used. It is also an expensive 25-51mm-equivalent lens, retailing for over $2,000. While the autofocus focus speeds sometimes leave me wanting, particularly in lower light, the image quality produced by the GF 32-64mm is outstanding. While the other GF lenses each offer their own special qualities, as far as versatility is concerned, the GF 32-64mm f/4 stands above the rest. 32mm (25mm eq. ), f/11, 7.5s, ISO 100. (From Fujifilm lens literature) The FUJINON GF32-64mmF4 R LM WR is a standard zoom lens specifically designed for the new G Mount and 43.8 x 32.9mm sensor. The GF lens range, which can cope with resolutions up to 100MP, combines the latest technologies with extensive knowledge accumulated from making XF lenses to deliver the best possible image quality and realize the full potential of the new GFX 50S medium format mirrorless camera. The intuitive controls include a C position on the aperture ring, which allows you to adjust the aperture value with the command dial on the camera body. The A (Auto) and C positions are now lockable and all the lenses are weather and dust resistant, plus they can work in temperatures as low as -10 degrees C for worry-free shooting outdoors. Brass mount has been adopted for the strength. This new lens series is set to become a professional workhorse. A standard zoom lens with a 21-51mm focal range (35mm format equivalent). 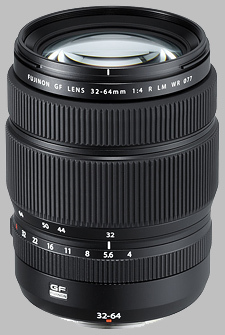 The Fujinon GF 32-64mm f/4 R LM WR doesn't have any user reviews yet!